Contacts commonly request agents to call them back at a time when they are not busy. If a script designer has placed a Schedule Callback component in a script, the agent can schedule the callback directly from the script. Click the Date Input icon. 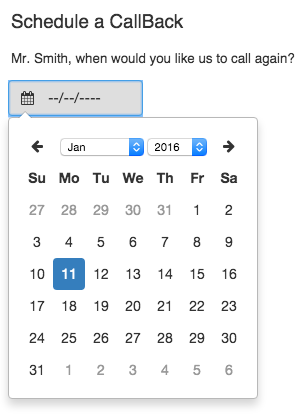 Select the month, year, and day of the callback. Type in the hour and minute of the callback. Use the arrows to select AM or PM, or type A for AM or P for PM. Begin typing a time zone name and select the appropriate time zone for the contact from the list. Each time zone gets its name from a continent or ocean and then the largest city in the region, for example, America/New_York or Europe/Paris. 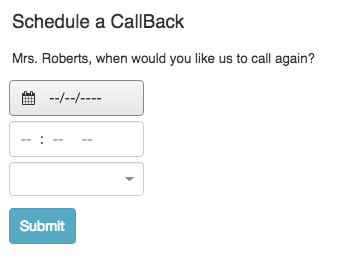 If the script has a button or link, such as Submit, click it to submit the callback. If the script has no button or link, the script designer could have built in a feature to save the callback as the agent selects the date, time, and time zone. If you are unsure how to submit a scheduled callback, ask your manager or supervisor for help. Important: To ensure that a return call is placed at the time scheduled by the agent, the campaign must be running at the time the callback is scheduled to happen. Once placed, the call is routed to any available agent. If the campaign is off, the callback number is pushed to the top of the campaign's queue of the calls waiting to be placed. The contact is not dialed until the campaign is turned on, but it is dialed before normal contacts are called.